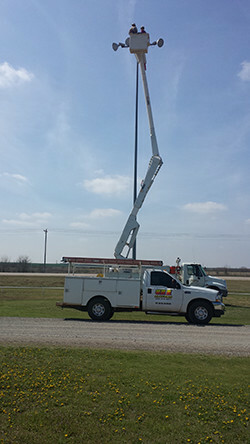 At Dale’s 81 Electric, LLC, we know that you want to work with versatile and knowledgeable electrical contractors in Kingfisher, OK. That’s why we pull from 45 years of combined industry experience to provide you with the highest quality services possible. Unlike other electrical contracting businesses, our talented team of professionals specializes in a wide variety of services that are designed to support all of your electrical needs. Whether you require residential, commercial or rural electrical services, we can provide the best offerings at an affordable price. Each of these services is performed with the utmost attention to detail and communication with our clients. Whether we’re working on a home remodel or a commercial repair, we believe in keeping customers informed and active in the decision-making process for every step of the way. When you work with Dale’s 81 Electric, LLC, you can trust that you have highly qualified professionals working on your property. What sets us apart from other electricians in Kingfisher, OK is our dedication to our clients. For the past 15 years, Dale’s 81 Electric, LLC has earned its reputation as an electrical service provider that always has the customer in mind. This attention to client services stems from our being a locally owned and operated business, as well as a genuine desire to provide the people of our community with exceptional electrical offerings. Whether your electrical needs are commercial, residential or rural, we’re available to assist with exceptional professionalism. For more information on the extensive selection of electrical services offered by Dale’s 81 Electric, LLC contact us today by calling 405-375-4207.